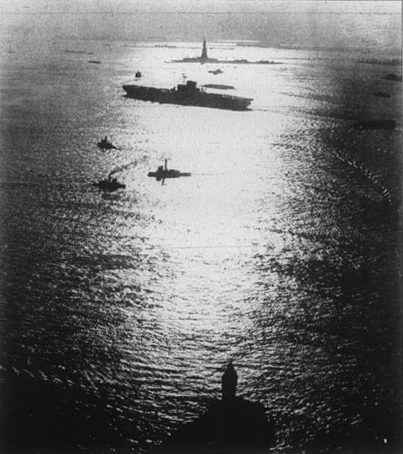 The sun, sea, Statue of Liberty and the Carrier USS Midway, all combine to make this striking study in silhouettes. Photo was taken from Whitehall Building as the Midway was outward bound to resume maiden voyage interrupted by Navy Day Ceremonies. John Reidy, "Navy Razzle-Dazzle," in POYi Archive, Item #143, http://archive.poy.org/items/show/143 (accessed April 18, 2019).